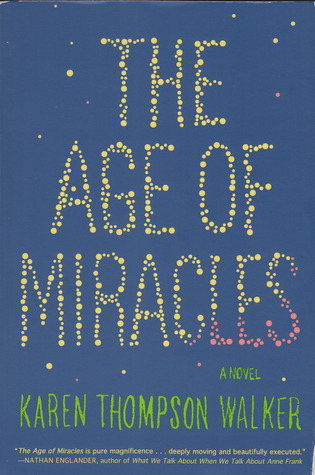 This is my review and thoughts on The Age of Miracles by Karen Thompson Walker. Overall, I enjoyed this book. It was captivating and held my attention the whole book. I enjoyed the main character and the supporting cast. I would have liked the book to tilt more heavily toward the end of the world part, despite knowing the primary theme was coming of age. I just felt there could have been a bit more doom, especially since the book kept using gimmicks like “of course, in hindsight” and “little did we know at the time”. That made me believe there was more doom to come. If the author had just cut that out, my expectation for more end of world disaster would have been lessened. Here are my answers to book club questions (questions provided by the publisher). 1. As readers, why do you think we’re drawn to stories about the end of the world? What special pleasures do these kinds of narratives offer? And how do you think this element works in The Age of Miracles? I think we are drawn to stories about the end of the world because it would cause such an intense reaction. An intense feeling of emotions, of evaluation, of hope and despair, and decision making. It is fascinating to see how people would respond if the end was near. Plus, there is is no other experience like it. We have things like doctors responding to high stress situations, and while very compelling, does not come close to the magnitude of the end of the world. Even from an emotional standpoint, there is no experience like it. Even in our own deaths, many people find solace knowing that they will live on in their children. But how does one cope with the fact that not only will you die, but the whole human race? 2. How much do you think the slowing alters Julia’s experience of adolescence? If the slowing had never happened, in what ways would her childhood have been different? In what ways would it have been the same? The book focuses on the fact that Julia is more effected by her coming of age experiences than The Slowing. This is only natural. Teenagers have a very hard time realizing their own mortality. This is no different. The big difference for her is that everyone around her is feeling an upheaval, not just her. What is interesting about this is that a lot of times in life, grownups are going through their own changes. We seem to think that adults always have their lives in order when that is simply not the case. The Slowing only highlights the adults’ weaknesses. 3. Julia’s father tells several crucial lies. Discuss these lies and consider which ones, if any, are justified and which ones are not. Is lying ever the right thing to do? If so, when? The world is not black and white. Lying is not always a matter of simply being right or wrong. What is to be gained by telling Julia’s mother the truth about the man she hit? It wasn’t her fault, she passed out. Besides, the man threw himself in front of her car. What Julia’s father did was merciful. It’s part of Julia’s coming of age. Kids are taught lying is wrong, because they are unable to differentiate the subtle difference of when it is right. The truth of the matter is, most of the time, lying IS wrong. It’s the rare occasion that lying is better for a person. Most often times, lying is only okay when it helps the other person, not yourself. Since those situations when lying is the right thing to do is so very infrequent, it is easier to say all lying is wrong. It is a very fine line between when it is truly better for the other person, and not the one who is lying. 4. How would the book change if it were narrated by Julia’s mother? What if it were narrated by Julia’s father? Or her grandfather? Julia’s mother would be focused on sustaining her family and trying to control as many factors as possible. As a mother and a nurturer, she would want to be keenly aware of all the threats to her nuclear family. Julia’s father seemed to be most focused on a midlife crisis, questioning the choices he had made and romanticizing all the freedoms he lost with his family. He loves his family, he just acutely feels all the possibilities lost with the end of the world — a super-nova midlife crisis, if you will. I think we would see a lot of id from him. Julia’s grandfather seemed to be channeling the pragmatic response to The Slowing. 5. Did you identify more with the clock-timers or with the real-timers? Which would you be and why? I identify more with clock-timers. I could foresee almost instantly the need for that. Plus, I have been a night-shift worker before. Your body can adjust. 6. The slowing affects the whole planet, but the book is set in southern California. How does the setting affect the book? How important is it that the story takes place in California? I think it is important the novel was set there. The author touches on it in the book. The Slowing would effect different areas of the world much differently. People in California have the money to build radiation shelters, people in 3rd world countries do not. Access to water, sunscreen, electricity, food — it would all differ based on where you lived. The author notes briefly an episode of violence – a gun going off. That would be much more common in nondemocratic countries and countries where resources dwindled even faster. 7. How do you feel about the way the book ends? What do you think lies ahead for Julia, for her parents and for the world? Who knows? The book made it sound like things were progressing very rapidly. At the end of the book, Julia states she is in her 20’s, I think. I didn’t think they would make it that long. 8. The slowing throws the natural world into disarray. Plants and animals die and there are changes in the weather. Did this book make you think about the threats that face our own natural world? Do you think the book has something to say about climate change? It made me think how fast our diet would change to eating bugs for protein if all the fish died from an increase in the water temperature, all the birds died, and of course, I’m assuming mammals would go next. Sound — it was good. Narration — I thought the narration was top notch. I thought the narrator fit the story well and enhanced my experience. Great job.